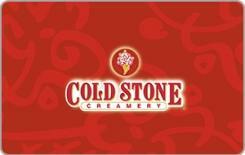 Earn 4.2 SB per $ when you buy Cold Stone Creamery gift cards at MyGiftCardsPlus, powered by Swagbucks. For more than 20 years Cold Stone Creamery® been serving up the finest ice cream, cakes, smoothies and shakes using only the highest quality ingredients, and of course, our signature process of preparing your custom creation on a frozen granite stone. But we're more than just serving up amazing ice cream. We're also in the business of making people happy. From our enthusiastic, singing crew members, to the shared laughter of a family enjoying an after-dinner treat- if it's making people happy, we feel like we're doing our jobs right.